This year’s theme is “Connect. Accelerate. Innovate.” We want to live these words by making sure that the conference allows you to connect with others in the open source community, accelerate your ideas and solutions and innovate when you get back to your projects and companies. There is one day of tutorials (Monday) and two days of sessions (Tuesday and Wednesday). We have multiple tracks: MySQL 8.0, Using MySQL, MongoDB, PostgreSQL, Cloud, Database Security and Compliance, Monitoring and Ops, and Containers and Emerging Technologies. This year also includes a specialized “Business Track” aimed at how open source can solve critical enterprise issues. 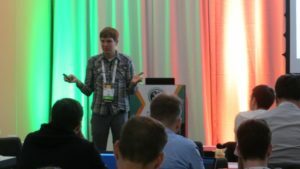 Each of the session days begins with excellent keynote presentations in the main room by well-known people and players in the open source community. Don’t miss them! Don’t forget to attend our Welcome Reception on Monday. Want to meet with our Product Managers? Join them for Lunch on Wednesday, November 7, where you’ll have a chance to participate in the development of Percona Software! On our community blog, we’ve been highlighting some of the sessions that will be occurring during the conference. You can check them out here. The entire conference schedule is up and available here. Percona Live Europe provides the community with an opportunity to discover and discuss the latest open source trends, technologies and innovations. The conference includes the best and brightest innovators and influencers in the open source database industry. Our daily sessions, day-one tutorials, demonstrations, keynotes and events provide access to what is happening NOW in the world of open source databases. At the conference, you can mingle with all levels of the database community: DBAs, developers, C-level executives and the latest database technology trend-setters. Network with peers and technology professionals and unite the open source database community! Share knowledge, experiences and use cases! Learn about how open source database technology can power your applications, improve your websites and solve your critical database issues. Tuesday and Wednesday’s sessions across eight different tracks provides something for all levels of experience, and addresses a range of business challenges. See the full schedule.